Mark Wilkerson spent eight years in the U.S. Army as an AH-1 Cobra and UH-60 Black Hawk helicopter crew chief with the 3rd Infantry and 101st Airborne Divisions. He was deployed with the 101st to Somalia for six months in 1993. He is the author of Who Are You: The Life of Pete Townshend and co-wrote Pearl Jam Twenty. He has three children: Alex, Nick, and Sam. He lives in Louisville, Kentucky, with his wife, Melissa. 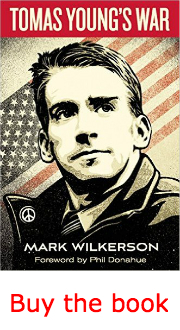 His latest book is Tomas Young’s War (Haymarket Books).